The status of adult neurogenesis, the production of neurons from neural stem cells (NSCs), in the subgranular zone (SGZ) of the hippocampal dentate gyrus (DG) and subventricular zone (SVZ) of the adult brain during normal aging [1, 2] currently remains a topic of hot discussion (see this recent Stem Cells Portal article). However, many studies support the requirement of hippocampal neurogenesis, and the subsequent survival and migration of new neurons, for learning and memory, while many also hypothesize a link between dysregulated hippocampal neurogenesis and the onset/development of a range of neurological disorders. Hence, researchers led by Linyin Feng (University of Chinese Academy of Sciences, Shanghai, PR China) sought to develop NSC-focused approaches to promote or regulate adult hippocampal neurogenesis as a means to potentially boost lost cognitive function and treat neurological disorders. In their new STEM CELLS study , Hui et al. report on the discovery of a novel compound that boosts adult hippocampal neurogenesis and increases the cognitive ability of adult mice. Could Yhhu‐3792 represent a novel drug candidate for the treatment of hippocampus-associated cognitive dysfunction? The authors discovered that Yhhu‐3792, or N2‐(4‐isopropylphenyl)‐5‐(3‐methoxyphenoxy)quinazoline‐2,4‐diamine, boosted the self-renewal of embryonic NSCs in vitro as evidenced by increased NSC proliferation, increased NSC number, and accelerated neurosphere growth. While one study reported the involvement of quinazoline‐based tricyclic compounds in nerve protection and neuronal differentiation , this study represents the first report quinazoline compounds directly affecting NSCs. Notch signaling regulates the fine-control of NSC proliferation and differentiation during nervous system development , and the study demonstrated that Yhhu‐3792 treatment activated the Notch signaling pathway and promoted the expression of Notch target genes, while the inhibition of Notch signaling prevented the pro-self-renewal activity of Yhhu‐3792. Excitingly, Yhhu‐3792 treatment also boosted the self-renewal of NSCs in vivo, as evidenced by the expansion of the NSC pool, elevated levels of endogenous hippocampal neurogenesis, and improved spatial and episodic memory following chronic administration in eight‐week‐old male C57BL/6 mice. The authors contend that this data support Yhhu‐3792 as a novel approach to boosting NSC self-renewal and hippocampal neurogenesis as a potentially exciting means to treat both hippocampus-associated cognitive dysfunction during aging and neurodegenerative disorders. For more on NSCs, hippocampal neurogenesis, and the treatment of neurodegenerative disorders stay tuned to the Stem Cells Portal! Boldrini M, Fulmore CA, Tartt AN, et al., Human Hippocampal Neurogenesis Persists throughout Aging. Cell Stem Cell;22:589-599.e5. Kempermann G, Gage FH, Aigner L, et al., Human Adult Neurogenesis: Evidence and Remaining Questions. Cell Stem Cell 2018. 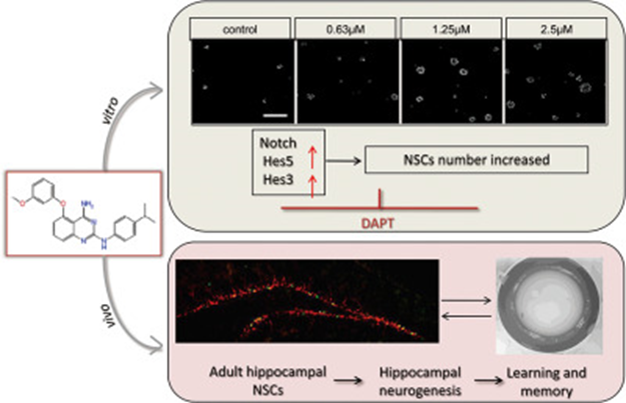 Lu H, Cheng G, Hong F, et al., A Novel 2-Phenylamino-Quinazoline-Based Compound Expands the Neural Stem Cell Pool and Promotes the Hippocampal Neurogenesis and the Cognitive Ability of Adult Mice. STEM CELLS 2018;36:1273-1285. Vainshtein A, Veenman L, Shterenberg A, et al., Quinazoline-based tricyclic compounds that regulate programmed cell death, induce neuronal differentiation, and are curative in animal models for excitotoxicity and hereditary brain disease. Cell Death Discovery 2015;1:15027. Louvi A and Artavanis-Tsakonas S, Notch signalling in vertebrate neural development. Nature Reviews Neuroscience 2006;7:93.